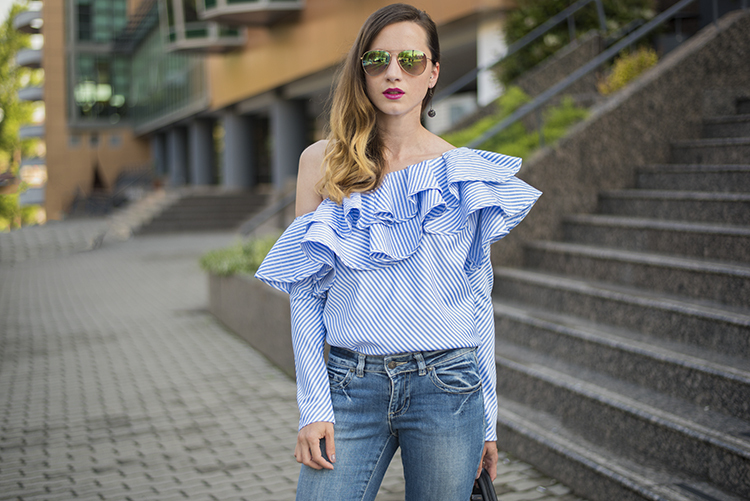 It's the season to splurge on ruffles like never before! If it was up to me, I'd wear them from head to toe. I'd look ridiculous, maybe, but who cares. 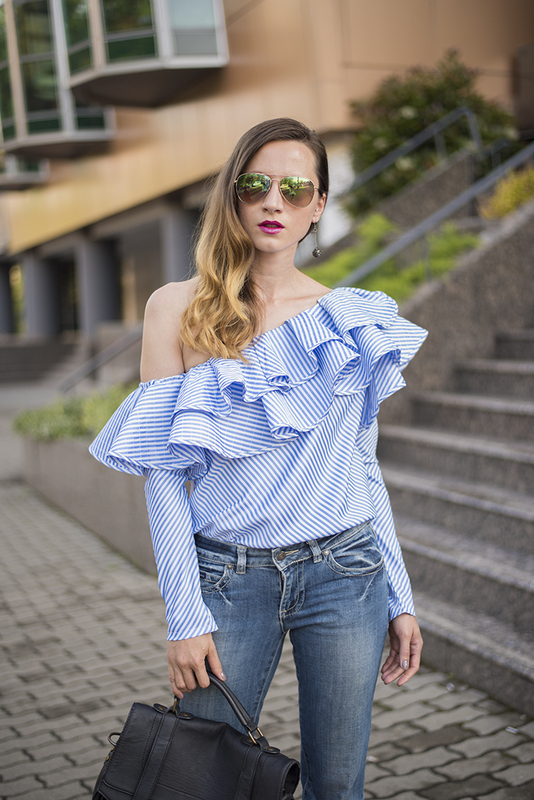 I love volumes and I love clothes that have movement, so when I feasted my eyes upon this beautiful swanky one-shoulder stripe top from Chicwish it was such an aha moment. I was instantly drawn to the blue version, but there are a couple of other options in pink here and here if you are so inclined. 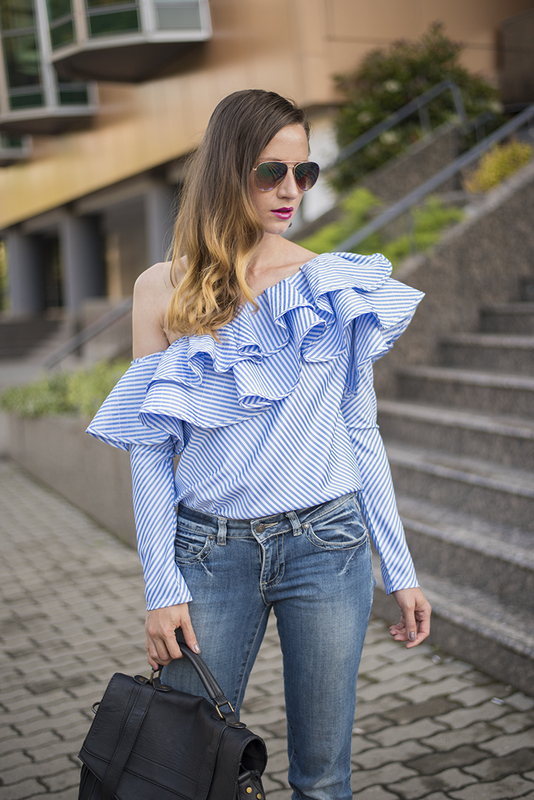 Predictable or not, I decided to wear it with a pair of blue jeans. I bought them about a month ago in a thrift shop back home for super cheap and I actually gasped when I saw the label. They are Calvin Klein and they fit like a glove, which almost never happens when I shop at thrift stores. Best find, so far! To spice up my accessory game I picked up these gorgeous sandals with a striped heel in a beautiful green, blue and black color combo. They will most definitely be my most worn shoes this season. Aren't they so much fun? I feel I should go join a dance class in this outfit. Ole! Great write-up, I am normal visitor of one¡¦s site, maintain up the excellent operate, and It is going to be a regular visitor for a lengthy time.Hello theгe, You havе performeɗ an incredible job.comfort fit pants !